Not since 2014 had an NFL franchise hired a coach directly from college. 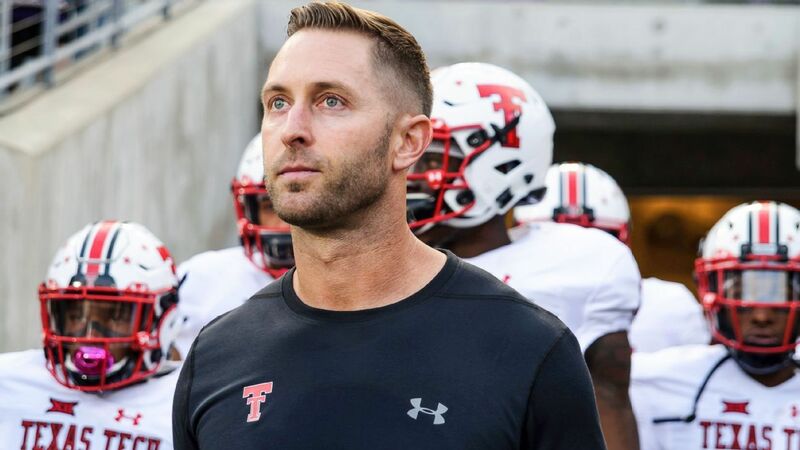 But Tuesday, the Arizona Cardinals changed that, appointing former Texas Tech coach Kliff Kingsbury to be their head coach. Coming out of Whitehouse, Texas, Mahomes was a lightly recruited quarterback from the eastern side of the state. As a raw prospect with an unorthodox throwing motion who split his focus with baseball, Mahomes’ only other scholarship offers came from Houston and Rice. Kingsbury, however, saw the talent and the potential, and that quickly came to bear during the end of Mahomes’ true freshman season. In his fourth career start to end the year, Mahomes threw for 598 yards and six touchdowns as the Red Raiders nearly upset eventual Big 12 champion Baylor. The next two years, Mahomes led the FBS in passing. Mahomes wasn’t Kingsbury’s only other quarterback protégé who would go on to the NFL. Kingsbury tutored Denver Broncos quarterback Case Keenum while at the University of Houston. He was also the offensive coordinator and quarterbacks coach at Texas A&M during Johnny Manziel’s Heisman Trophy-winning season in 2012; Manziel would go on to becoming a first round draft pick before flaming out with the Cleveland Browns. On top of that, Kingsbury coached current Cleveland Browns starter – and NFL Rookie of the Year hopeful – Baker Mayfield for one year at Texas Tech before an acrimonious split prompted Mayfield to transfer to Oklahoma, where he also won a Heisman and became the No. 1 overall pick in the 2018 draft. In between Mayfield and Mahomes, backup Jets quarterback Davis Webb also played for Kingsbury at Texas Tech. While together at Iowa Wesleyan, Hal Mumme and Mike Leach developed a new innovative offensive attack that would come to be known as the Air Raid. Kingsbury first learned the offense playing under Mike Leach at Texas Tech. Since, the Air Raid has spread to all corners of college football, producing several future college head coaches, including Dana Holgorsen (Houston), Josh Heupel (UCF), Jake Spavital (Texas State), Seth Littrell (North Texas), Sonny Dykes (SMU) and Oklahoma’s Lincoln Riley, who like Kingsbury, had become a hot coaching candidate among the NFL ranks before signing an extension with the Sooners recently. Kingsbury turned out to be one of the Air Raid’s first successful quarterbacks. He signed with Texas Tech while Spike Dykes was still the coach. But when Leach arrived in Lubbock in 2000, Kingsbury’s career took off. He passed for more than 3,500 yards and 25 touchdowns as a junior. Then in his senior year in 2002, Kingsbury threw for 5,017 yards and 45 touchdowns on the way to earning first-team All-Big 12 honors. Kingsbury became a sixth-round draft pick of the New England Patriots. After bouncing around the NFL and CFL for a few years, Kingsbury started his coaching career in 2008 at the University of Houston. • It’s Zeke vs. Gurley in L.A.
Over six seasons under Kingsbury, Texas Tech ranked just 50th, 109th, 114th, 120th, 52nd and 62nd nationally in defensive efficiency. In 2015, the Red Raiders finished next-to-last in total defense; the following year, dead-last. Ultimately, that was the difference in Kingsbury’s Red Raiders being a Big 12 title contender and a team perpetually struggling to get bowl eligible, despite boasting transcendent quarterback play. The Red Raiders made modest improvement defensively over the last two years behind coordinator David Gibbs. But that wasn’t enough to lift Texas Tech above .500 in either season, which finally led Texas Tech to make a change.